Lurcher sight hound hunting dogs, what are they? You can always look up wikipedia, but as most people understand an open source encyclopaedia is always going to be fraught with politics and potential misinformation. These base breeds of the lurcher were originally chosen for the sighthounds speed and hunting instinct. Lurchers that are created from two Sighthounds (eg Greyhound and Deerhound) are a subgroup of Lurchers called Longdogs (again this is not a recognised AKC breed). Longdogs are composites of the sighthound breeds, the most popular being the saluki, deerhound, whippet and greyhound hybrids. The cross of a Deerhound and greyhound is known as a Staghound. A popular lurcher in Australia is the Australian Staghound (native to that country with no direct origins elsewhere). They are said to look like a cross between a Greyhound and the Scottish Deerhound. They are a very distant relative of the American Staghound. Note there are breeds such as the Norwegian Elkhound that has nothing to do with the lurcher breeds. Nomenclature for many dog breeds can by quite sloppy. It is said that any breed of dog crossed with a sighthound is a lurcher. But I would be more bold to suggest that the majority of lurchers I have seen in my area are bred from a greyhound base and the other half another scent hound. The reason that Greyhounds and saluki dog breeds are used as the base breed for lurchers is their exceptional eyesight, large size and prey drive. Greyhounds are brilliant at seeing, and catching smaller game like vermin (rats and rabbits) however many hunters require stamina and greater attack abilities. A pure bred greyhound has thin skin and long potentially easy to damage legs. Breeding them with a smaller dog (regardless of temperament) will not have them hunt large game without risking considerable damage. Many lurchers such as greyhound crosses with working dogs like the working border are great but are aimed at hunting smaller prey. And that is why many hunters of larger, more dangerous game prefer lurchers such as the greyhound X wolf hound. 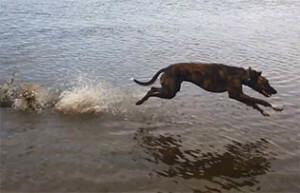 While the wolf hound won’t have the bite of the bull terrier, it will have considerable stamina and size, making the resultant lurcher large, fast and high endurance, with the ability to hold most game until the hunter arrives. The input lurcher breeds are also intelligent and are unlikely to get out of control with blood lust as can happen with some breeds. With the advent of many specialist cross breed hunting dogs like the various coonhounds you find in the American south, it is little wonder that the lurcher ‘breeds’ are taking off too in America. Much more than that, the greyhound and several lurcher mixes have also been found to be excellent companion dogs (when sufficiently walked off lead and socialised) meaning that they can serve a dual purpose of hunting dog, while being safe at home with children. Though mixing with cats and other non dog species can be problematic. This entry was posted in Dog Hunters, Hound Dogs, Scent Hound.